Our famous Shaker kitchens, with their clean lines and classical, balanced proportions, are versatile and timelessly stylish. Based on the designs of 19th century furniture makers belonging to the Shaker movement, our own Shaker style kitchen was created over 30 years ago and remains our most popular range. Shakers valued open-plan living space that was uncluttered and simple, and our Shaker design honours these principles with its perfectly balanced proportions. We are excited to introduce our new kitchen range, Arbor. Arbor blends the simplicity of our timeless Shaker range with touches of intricate detail from our Original range. Balancing the two ranges, Arbor creates a timelessly stylish kitchen which sits perfectly in any home aesthetic. Behind the scenes, our Original kitchen is built using the same tried-and-tested construction methods as our Shaker range, such as in-frame doors, biscuit jointing and solid oak dovetailed drawer boxes. But externally it has more traditional, delicate detailing, including beading on the doors and drawers and an ornate cornice. This classic kitchen design dovetails well with architectural features often found in Victorian and Edwardian homes. Our Linear kitchens combine minimalist, modern kitchen design aesthetics with tried-and-tested joinery techniques. We pride ourselves on the outstanding quality and durability of our kitchen furniture and the Linear range is no different, sharing the same quality construction methods for which we are famous. We are proud to introduce Linear Edge, our sleek and contemporary handleless kitchen design. Linear Edge is built using all of the tried and tested construction methods that give our Shaker, Original and Linear furniture its exceptional durability, but offers a handleless option for clients seeking a modern, clean aesthetic. Good design should make life easier. We understand the importance of thoughtful, well-designed storage solutions. As well as looking beautiful, your new bespoke kitchen must function flawlessly and provide a place for everything, making the best use of the available space. From our famous Pantry Larder and dovetailed oak removable cutlery trays to sophisticated ‘magic corner’ mechanisms and handcrafted wine racks, we offer a wealth of clever storage options and luxury statement pieces. 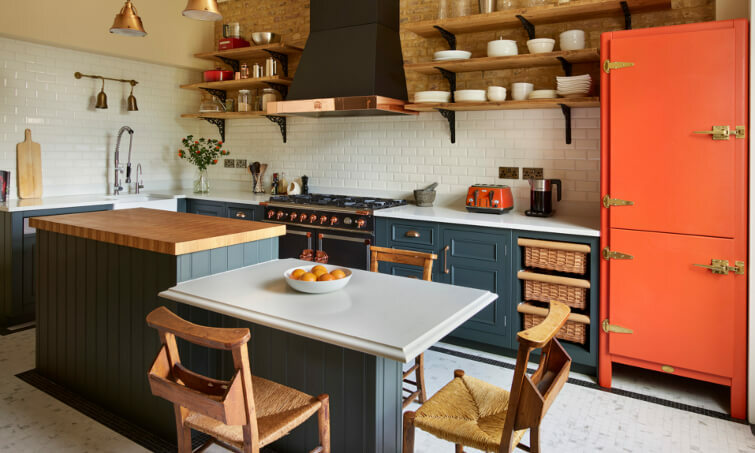 We have been making beautiful handmade bespoke kitchens for more than 40 years, designing and building kitchen solutions to order, to the exact specification of our clients. Whatever your taste, we offer a kitchen design that will suit – from our popular Shaker kitchen range and Linear kitchen range, to modern and contemporary kitchens and Arbor kitchens. Of course, you can also select bespoke options to create a truly unique bespoke fitted kitchen. Every one of the cupboards and drawers that make up our bespoke kitchen designs are fully hand-built pieces of furniture, made by skilled craftsmen in our Cambridgeshire workshop. Each of them are made using traditional framed construction whereby the doors and drawers are jointed using a hardwood-to-hardwood fixing and secured with high-quality hinges to ensure that they will never drop. This means that the clean, precise lines and perfect functionality of the furniture will remain for years to come. We're so confident in our furniture that we guarantee all of the kitchens we install and paint for a period of 10 years, giving you complete peace of mind. Our hand painted kitchens can also be very easily refurbished in the future, giving you the option of completely changing the look of the room without the upheaval of changing the furniture. Our expert kitchen designers are on-hand throughout the project to advise and assist when choices need to be made.